The Whitaker House series of Smith Wigglesworth sermon compilations have been updated for the modern reader. Words, expressions and sentence structure have been revised for clarity and readability. In addition, modern Bible translation has been quoted to make the language of the entire text readily understandable while maintaining the author's original premises and message. 192pp. Whitaker House, New Kensington, PA, USA, 1999. 203pp. Whitaker House, New Kensington, PA, USA, 1998. 222pp. Whitaker House, New Kensington, PA, USA, 1998. 207pp. Whitaker House, New Kensington, PA, USA, 1999. 220pp. Whitaker House, New Kensington, PA, USA, 1998. 205pp. Whitaker House, New Kensington, PA, USA, 1998. 204pp. Whitaker House, New Kensington, PA, USA, 1998. 206pp. Whitaker House, New Kensington, PA, USA, 2000. 222pp. Whitaker House, New Kensington, PA, USA, 2003. 224pp. Whitaker House, New Kensington, PA, USA, 2006. 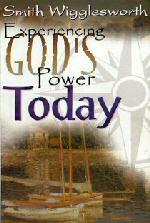 Revised edition of previous publication ‘Smith Wigglesworth on Power to Serve.’ 1998. 576pp.Whitaker House, New Kensington, PA, USA, 1999. 540pp. Whitaker House, New Kensington, PA, USA, 2000.